Prezi is a cloud based application to create and show presentations. It is a functionally attractive alternative for powerpoint. Prezi (pronounced as prezzi) presentations are stored in the cloud, i.e. on the Prezi website. This means you must be connected to the internet to show a presentation, although the more expensive licenses allow for offline presentations as well (Prezi Desktop). With the standard public license all of your presentations are visible for the world. Example presentations, user manuals, and instruction videos are available online. For teachers and students an extended license is available for free, the so called "Edu Enjoy" license. Your mail address is used to check if you belong to an educational organisation, so use an RU address which ends in "ru.nl" (e.g. "science.ru.nl" or "fnwi.ru.nl") to qualify for an Edu license. The registration process itself is straightforward. Warning: It is possible that the verification email is put into the "spam" folder. Compared to the regular Enjoy license the Edu Enjoy license does not offer Premium (e-mail helpdesk) support. Logon to the Prezi website. 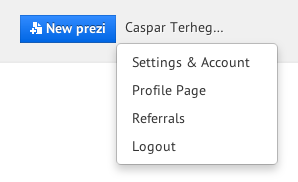 Click your account name (upper right) and choose "Settings & Account"
Halfway down the page under "Account & license" click "Upgrade your license"
In the Enjoy column choose "Student & Teacher licenses"
This page was last edited 14:27, 28 January 2015 by Caspar Terheggen.